(Phys.org)—A team of researchers working at NASA's Goddard Space Flight Center has developed a model meant to show what the early moon may have looked like. 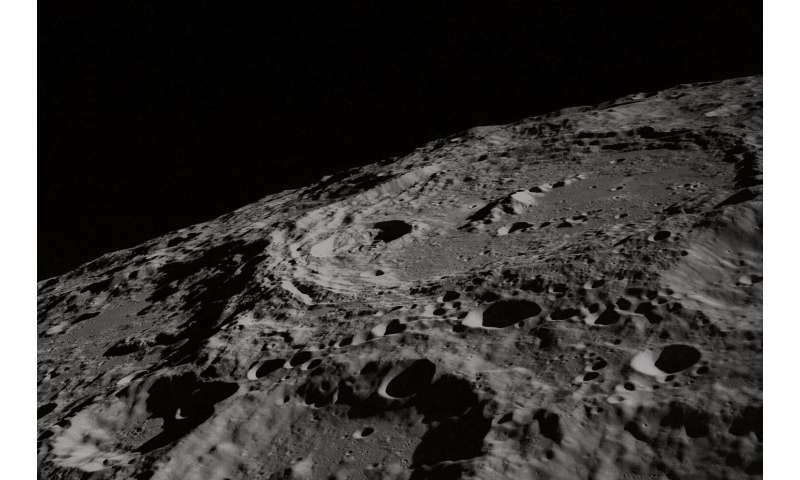 As they note in their paper uploaded to the arXiv preprint server, study of rocks from the area between the near and far side of the moon could bolster their theory—and if it is found likely to be correct, it could impact theories regarding how the moon formed. A consensus of sorts among space scientists holds that an object approximately the size of modern Mars slammed into the Earth billions of years ago, knocking some surface material into space—that material eventually coalesced to become our moon. But what happened between the time the moon formed and now is still rather a mystery. A collision between massive objects would create a lot of heat, which means that if such a collision did lead to the formation of the moon, both would have been extremely hot for a long period of time thereafter. In this new effort, the researchers have used findings from prior efforts, such as examining moon rocks, to build a model that they believe could possibly represent the actual history of the moon not long after it was formed, based on a Mars-type collision. The researchers report that their model shows the moon covered with a thick ocean of melted rock. Under such a scenario, volatile atoms (possibly sodium) would have vaporized, eventually forming an atmosphere. But because only one side of the moon faced the earth, the atmosphere would have been very different on its near and far sides. The model showed much of the atmosphere closest to the Earth vaporizing due to the heat from the nearby planet. It also showed vast differences in temperature between the moon's far and near sides, a situation that would have given rise to very strong winds—strong enough to cause waves on the hot surface of the ocean. But then the model shows the moon slowly cooling, and as it did so, some rocks bobbled to the surface. More cooling allowed more rocks to float to the surface, eventually forming a crust. Once that happened, the atmosphere dissipated as vaporizing from the ocean ceased and the ocean below solidified. If such a scenario is true, the researchers note, evidence would have been left behind—higher concentrations of sodium, for example, in rocks found in the separation zone between the near and far sides of the moon. Future missions to the moon could study such rocks, they add, and if the concentrations of sodium match the model, it could offer some credence to the scenario that the model depicts. We create the first quantitative model for the early lunar atmosphere, coupled with a magma ocean crystallization model. Immediately after formation, the moon's surface was subject to a radiative environment that included contributions from the early Sun, a post-impact Earth that radiated like a mid-type M dwarf star, and a cooling global magma ocean. This radiative environment resulted in a largely Earth-side atmosphere on the Moon, ranging from ∼104 to ∼102 pascals, composed of heavy volatiles (Na and SiO). This atmosphere persisted through lid formation and was additionally characterized by supersonic winds that transported significant quantities of moderate volatiles and likely generated magma ocean waves. The existence of this atmosphere may have influenced the distribution of some moderate volatiles and created temperature asymmetries which influenced ocean flow and cooling. Such asymmetries may characterize young, tidally locked rocky bodies with global magma oceans and subject to intense irradiation. Looking at the paper, one can infer that at some point the early moon must have had a 1 day geosynchronous orbit. That would have meant lots of deep solar and lunar eclipses, plus a magnificent view of the moon, for one side of the primitive Earth, but not the other. Experimentally moon rocks, or simulations of moon rock could be heated to see what vapour comes off. The atmosphere would also be rich in potassium. And the rarer rubidium, caesium, zinc, lead, cadmium and mercury would also be in the gas phase. The moon may have been rotating at the time though, so there may not be much of a difference between near and far sides. But the poles should have been cooler and may have more of the condensate there. Slow cooling of silicon monoxide should result in silicon and silica forming, so this should also predict silicon crystals at the poles.